One of the USA’s leading developers of Demand-Responsive Technology (DRT), DemandTrans Solutions, has partnered with the French driverless technology company EasyMile, to provide efficient autonomous transport systems to public agencies across North America. The new partnership between DemandTrans and EasyMile aims to provide a safe and seamless autonomous public transportation experience that will soon be available in cities around North America. The non-exclusive partnership will enable public transport providers to offer on-demand service to driverless shuttles that are integrated within multi-modal transportation systems. The two companies will also provide a customer-facing application that will enable point-to-point Mobility-On-Demand autonomous transportation. EasyMile was founded in 2014 and is headquartered in Toulouse (France), with regional offices in Denver (USA), Berlin (Germany) and Singapore. The company provides autonomous driving software and technologies for the first and last mile transportation of passengers and goods in various application sites, including private areas, urban, suburban and rural environments. 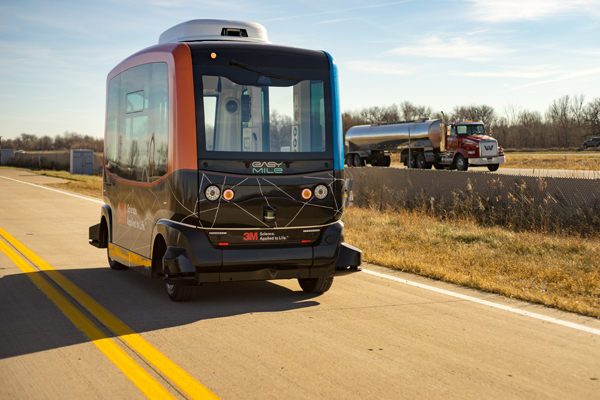 EasyMile’s driverless EZ10 shuttle has already been deployed in 20 countries, including Asia-Pacific, North America, Middle East, and European regions. DemandTrans has offices in Illinois and California in the USA and has been instrumental in delivering advanced technology and software applications to solve challenging problems in the transit industry. From operations management, resource scheduling, predictive modeling, transportation optimization and smart city solutions, the company works globally to design and deliver intelligent transit technology to help make Mobility-On-Demand an actionable reality in any city of any size. “Mobility-DR and Switch, our mobility-as-a-service technologies, function as automated mobility operators, seamlessly integrating legs of a trip to maximize the user experience,” explained DemandTrans’ chairman, John E Michel. Lauren Isaac, EasyMile’s director of business initiatives in North America, commented, “We are excited about this partnership because we believe it’s combining best-in-class technologies to truly personalize the customer experience. Customers expect to use their smartphones to get from point to point, and now they can do so with an autonomous shuttle.